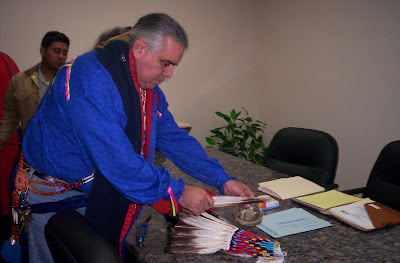 Robert Soto, a professional Native American dancer who also pastors the McAllen Grace Brethren Church in McAllen, Texas, has been involved in a protracted legal situation. I find it hard to believe that on August 11, we celebrated 1 1/2 years since the Department of Interior came to our pow wow and took 42 of our eagle feathers. I have gotten well over 5,000 e-mails from people all over the world concerning this event. Instead of granting the motion to dismiss our case, the judge set a court date for September 7, 2007, for a status hearing where the judge will ask both parties to produce a settlement outside of court. The problem is that the lawyers for the Department of Interior have already said they will not yield to our demand. 2. Give the rights for all American Indians to use the feathers regardless of status, without fear of the government. 3. Give the Lipan Apache the right to be American Indians and recognize us as American Indians. We want to thank you for your prayers and for all the letters of support. I just wanted to let you know that our trial scheduled for September 7, 2007, at 2:20 PM has been postponed and moved to another undetermined date. So we have more time to write or call the people and departments that were mentioned in the letter earlier. I will write again when a new hearing date is scheduled.